The Xinjiang Uygur autonomous region has made great progress in the fight against poverty over the past few years, with the development of industries covering a wide range of fields. Bupatam Ismail from Kashgar used to help her parents do temporary jobs and chores at home to support her family. The crops on the family's 0.2 hectares of land were far from enough to feed four, especially when her younger brother was in high school. 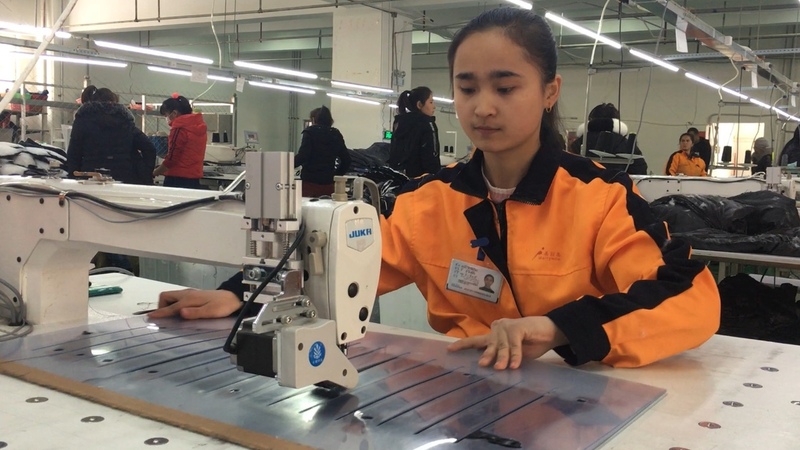 Fortunately, she was recruited by a garment factory set up by a Shenzhen clothing company three years ago, and the new opportunity brought her a steady income and helped her gain respect and self-reliance. Bupatam has been working in the factory for two years, the first time she has worked at a real company. Starting with no experience, Ismail became a quality inspector after three months of training. Her diligence and work ethic earned her a promotion to deputy director after just one year. "I earn over 4,000 yuan ($581) every month now and I'm very happy with the salary and the working environment," she said, adding that she bought a couple overcoats for herself and her boyfriend and a down jacket for her brother. Bupatam is one of more than 3,000 residents employed by the Shenzhen clothing company. More people from Xinjiang are expected to be lifted out of poverty, since about 60 clothing enterprises have brought numerous job opportunities. Li Huijun, CEO of garment factory Meili'ao, said that with preferential policies, including lower raw cotton prices, cheaper electricity rates and transportation subsidies, clothes produced in Xinjiang can save manufacturers a great deal of money compared with eastern regions, where the clothing industry has traditionally flourished. "When we first came here, many employees could not speak Mandarin, which made it difficult to communicate with them. And for most of them it was the first time they had a real job, and they often quit for no reason," Li said. Burebgul Ali, 23, was reluctant to work at the factory. Her mother wanted her to stay at home to help with housework and take care of her 6-year-old daughter. But after skills training and learning Mandarin, Burebgul found her job quite comfortable and could make at least 3,000 yuan per month. As the only one making a good salary, she now really enjoys her work. "My mother fully supports my job and prepares breakfast and dinner for me every day to ease my burden at home. Even when my daughter became ill, she would take her to hospital instead of asking me to take a day off," Burebgul said. After working in the factory for a year, Burebgul built a new house and bought an LCD television and some furniture. She also rewarded herself with a smartphone and learned how to use it for chats and online shopping. Li said employees have become more competitive and demand more from life. If they earned 5,000 yuan last month but only 4,000 yuan this month, they feel dissatisfied with themselves. "Some senior employees have received shares in the company. They run the company like it's their own. Most importantly, they are becoming more independent and confident," Li said. Burebgul is thinking about taking a driving test next year and beginning to save money to buy a car.